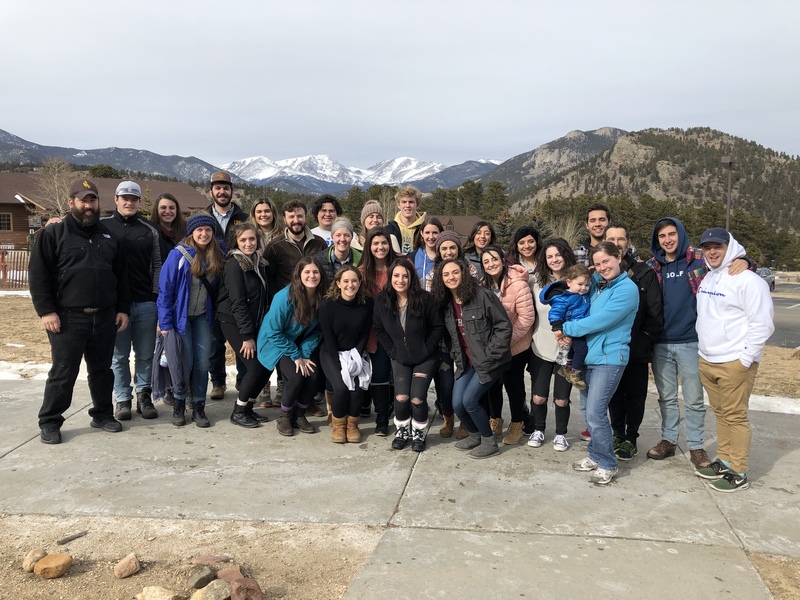 ESTES PARK, CO - Twenty-five OCF members from numerous Orthodox jurisdictions along the Front Range spent the weekend of February 8-10 together at the YMCA of the Rockies for a weekend of faith and fellowship at the annual OCF Mountain Region Retreat. The retreat began with introductions and ice-breakers led by retreat organizers Quinn Marquardt of UW and Sarah Timby of UNC in Greeley, CO. Afterwards, all chanted together in prayer offering the beautiful hymns of the Paraklesis service to the Blessed Mother of God. On Saturday, the day began with the matins service and breakfast, followed by free time and discussion sessions related to the retreat theme -- 'Living Life in Christ: in the world, not of the world.' Discussions took place with the Sunday Gospel passages of the Triodion period serving as a guide. Following the morning sessions, those attending the retreat had the oppurtunity to enjoy the retreat facility. The YMCA offers quite a number of activities such as ice & roller skating, archery, snowshoeing, hiking, and in addition, the town of Estes Park and Rocky Mountain National Park are both in close proximity making a trip to either destination quite possible. The retreat participants took advantage of these activities and more during free time! Following activity time, all again met in the chapel where another session was offered. Father Jordan Brown of Saints Peter & Paul Greek Orthodox Church in Boulder, CO led this session. Father Jordan shared a beautiful story of a priest named Papa Georgi who as a youngster in a small village in Greece witnessed firsthand the ravages of WWII at the hands of the NAZI forces who murdered hundreds of people in the village of Kalavryta. Father Jordan taught all the following hymn which was taught to him by this same priest in Greece, 'Theotokos you are the hope of us Christians one and all, guide and shelter and protect, all who put their hope in you.' After vespers, Sarah shared a beautiful testimonial of faith from her experiences growing up as an Orthodox Christian and encouraged her fellow OCF members to continue in their spiritual journey. Dinner, a campfire, confessions, and meaningful conversation with new and old friends was a special way to conclude a blessed day. On Sunday, all of the retreat participants came together yet again and prayed the Divine Liturgy with Father Jordan serving. Concluding remarks were offered and retreat organizers, Quinn and Sarah thanked all OCF members who attended, as well as Father Jordan for taking the time to be with the students. We thank also Father Christodoulos Papadeas of the Brotherhood of Saint George in Denver for covering Divine Liturgy for Father Jordan in Boulder in his absense. A great, big 'thank-you' to National OCF for sponsoring and underwriting a large portion of the retreat costs! We look forward to the 2020 OCF Mountain Region Retreat!